Flooding along the Llano River crested at nearly 40 feet Tuesday morning. Authorities estimated 85 properties had been damaged. If you have not evacuated, do so immediately... Live Oak, Lakeshore Drive, Pecan Circle, Backbone, Barrier Lane, Louise, Edith, So. Ave. J, 2147 W, including Waterside and RV Park. Shelters at Meadowlakes City Hall and the Marble Falls Middle School. Ron Anderson, the Llano County emergency management coordinator, said there had been "no fatalities, no injuries related to the flood" reported. In Burnet County, a body was found today near Lake LBJ. Authorities said it does not appear to be a person missing from the South Llano River flooding in Junction more than a week ago. At a news conference Tuesday, Anderson said residents would not be able to return to their homes for 24-36 hours because the river was expected to rise again. He called the situation "absolutely hazardous" and said law enforcement would be on patrol. KUT's Mose Buchele reports from the First Baptist Church in Marble Falls, which was being used as a shelter. The National Weather Service said the Llano River is expected to rise again Wednesday morning. In response to the severe weather, Gov. Greg Abbott issued a disaster declaration for 18 counties: Bastrop, Burnet, Colorado, Fayette, Hood, Jim Wells, Kerr, Kimble, La Salle, Live Oak, Llano, Mason, McMullen, Nueces, Real, San Patricio, Travis and Williamson. KUT's Mose Buchele was at the First Baptist Church in Marble Falls, which was being used as a shelter. Certain parts of the area have seen as many as 12 inches of rain in the past three days, and that sustained downpour pushed the Llano River to 30 feet above flood stage Tuesday morning. 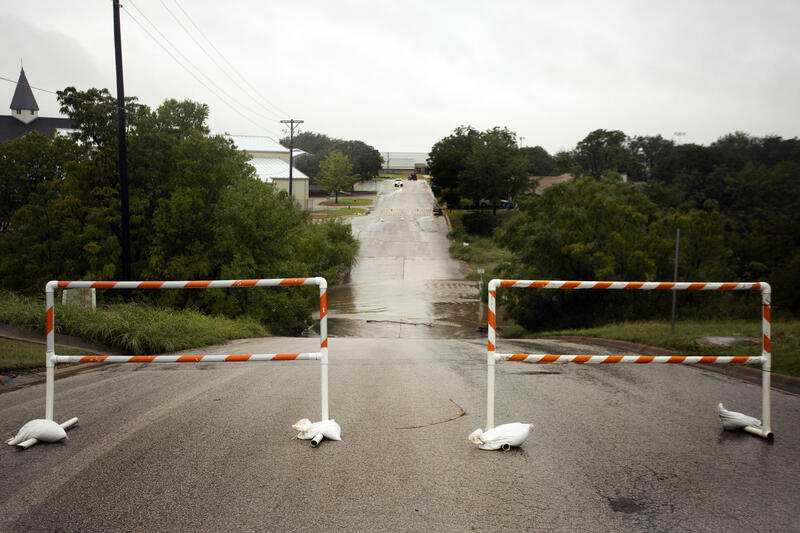 In Kingsland, floodwaters swept away a bridge across the Llano River on FM 2900. The river topped out at nearly 40 feet Tuesday morning, but the National Weather Service expects waters to surge again Wednesday. In a Facebook post, the Llano County Office of Emergency Managment called the flooding "historic." The Lower Colorado River Authority has closed until further notice lakes Buchanan, LBJ, Inks, Marble Falls and Travis as a result of flooding along the Colorado River. It warned people within the Highland Lakes Watershed to "take action to protect people and property." 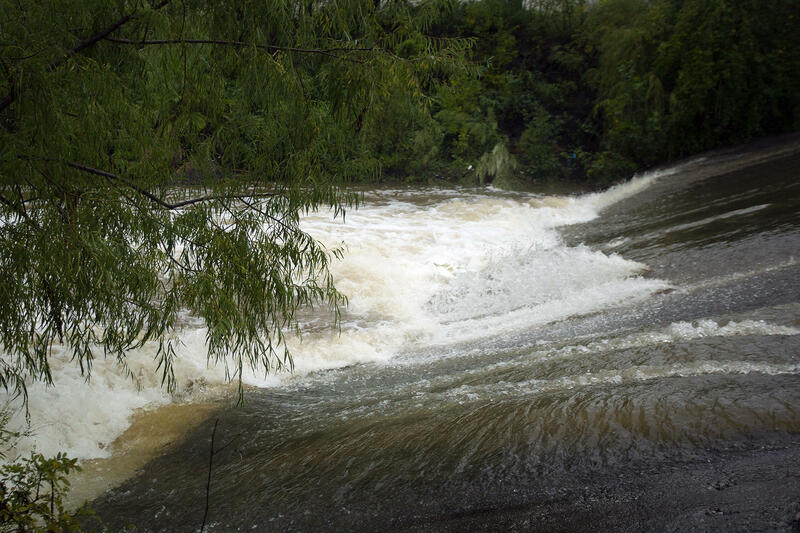 The authority opened floodgates at Wirtz, Starcke, Mansfield, Tom Miller and Buchanan dams. A flash flood warning was in effect until 9:30 p.m. for Llano and Gillespie counties and southern portions of Burnet County. In Austin, the Austin Fire Department has issued a ban on recreational activity in all waterways within the city limits until Thursday at noon at the earliest. The city has closed Barton Springs Pool, the Barton Creek Greenbelt and the Ann and Roy Butler Hike and Bike Trail. Abbott said this morning that the state is prepared to send resources to areas affected by flooding. Forecasts suggest the sustained rains could continue over the next two days. 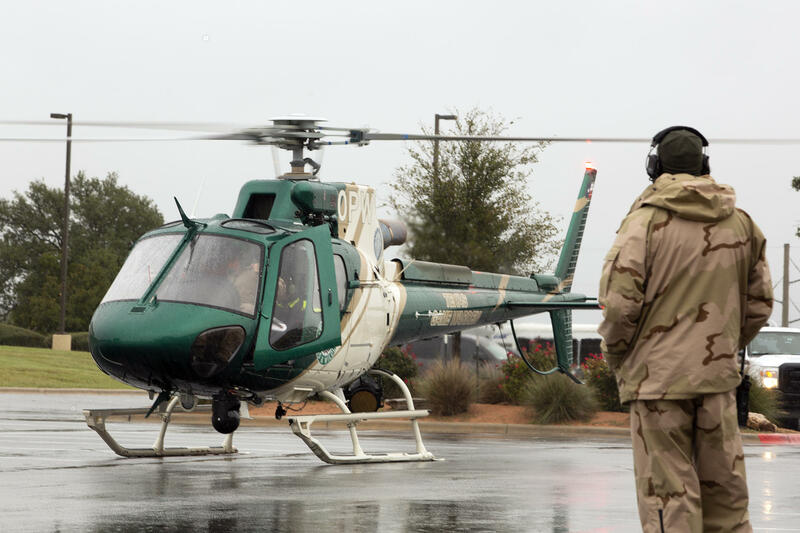 A Texas Game Warden helicopter prepares to take off from First Baptist Church of Marble Falls to surveil the area.